Rolled sushi for the setsubun festival on February 3, eaten in the evening, with closed eyes, in silence, one roll making a wish, facing the auspicious direction of the new year. oboro denbu (pink), egg roll or datemaki, cucumber, kanpyoo stripes, Kooyadoofu, anago or eal, shiitake mushrooms. 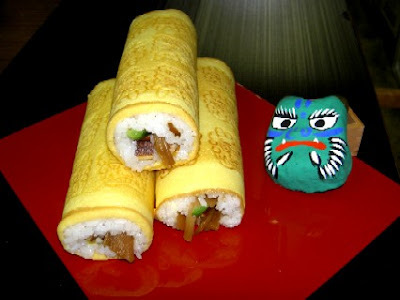 All the good luck and good fortune is rolled up (maki) in this sushi. 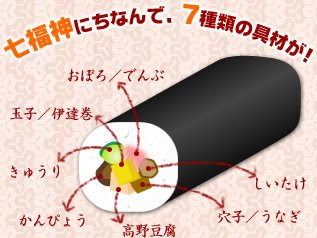 Sometimes the roll is made with 12 ingredients, usually eaten at the Setsubun festival on February 3. Legend says when Toyotomi Hideyoshi was fighting for the rulership of Japan, one of his samurai, Horio Yoshiharu 堀尾 吉晴 ate a rolled sushi (makizushi) on the evening before the battle and then the warriors won the battle. 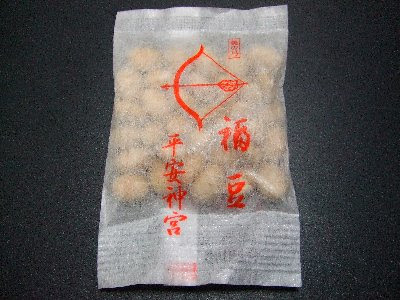 So now it is eaten to bring good luck when driving out the demons of Setsubun. Others say it comes from Osaka and the Kansai area, where rolled sushi was eaten hoping for prosperity in the coming year. The store Hisagozushi in Kyoto also prepares a roll with the egg outside and the imprint of a demon on it. sold only on February 3. Clever bakeries in Okayama make an auspicious roll with sponge cake in green color from powdered tea and roll fruit of the season and whipped cream inside. Setsubun was the last day of winter and thus also the eve of the beginning of spring and the New Year according to the old lunar calendar. According to ancient Asian lore, the new year comes with a new deity, the "God/Godess of the Year" toshi toku jin (Toshitokujin) 歳德神. This is part of the Yin-Yang Theory of China, called "onmyoodoo 陰陽道" in Japanese. He is celebrated in a part of the estate which shows to the auspicious direction of this year (ehoo　恵方). People erect a small shelf with sacred decorations for the purpose and pray for a boutifull harvest and good luck as farmers. Things related to EHOO are kigo of the New Year. This is the only shrine in Japan which changes its direction every year, so the visitors can bow toward the auspicious direction of the new year. The priests come to turn the upper stone on a special device to change the direction. Bags of beans are sold at the shrines Yoshida Jinja 吉田神社, Heian Jingu 平安神宮 and others to throw at the demons. 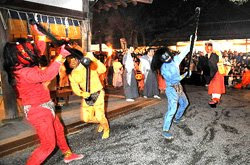 At Yoshida shrine, a blue, red and yellow demon are driven out with bow and arrow on the day before setsubun in front of many spectators. The event starts after 6 in the evening. A demon queller, called Hoosooshi 方相氏（ほうそうし） appears with arms, then people on the stage shoot magic arrows (魔力を封じる弓矢) to ban them completely. The demons leave crying loudely as the children cheer them out. Kindergardens and other facilities also have events driving out the demons with toy bows and arrows.
. akaiwashi uri 赤鰯売り selling "red iwashi sardines" . oni no mesashi might point to the Chinese custom of piercing one eye of a person and make him a slave. oni no mesashi 鬼の目さし piercing of the demon's eyes. 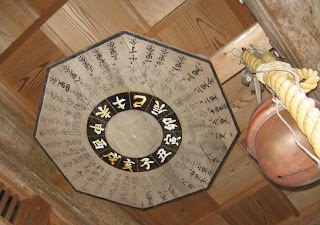 They hang a branch on the 鬼門の窓 window of the Kimon side of the house. The same custom is observed in other parts of Japan, for example in 枚方市 Hirakata , Osaka. This haiku refers to the New Year's custom of visiting a shrine or temple located in a lucky direction. Ironically, Issa and his cohorts are heading for a village and (I assume) its tavern.